Sometimes I write a story where lots of exciting stuff happens, my protagonist is proactive and has a goal, and I’m hitting all the right beats (if you don’t know what those are, check out this post on the 15 Story Beats), yet the story still feels flat. What’s wrong? What am I missing? The truth of the matter is often I’m not missing anything. I spend a lot of time developing my stories and I know all the story parts that I need to make a story sing, but effectively implementing those parts into a manuscript is a whole other challenge. In a manuscript, those parts can get out of whack or lost or muddy. So how do you fix it? 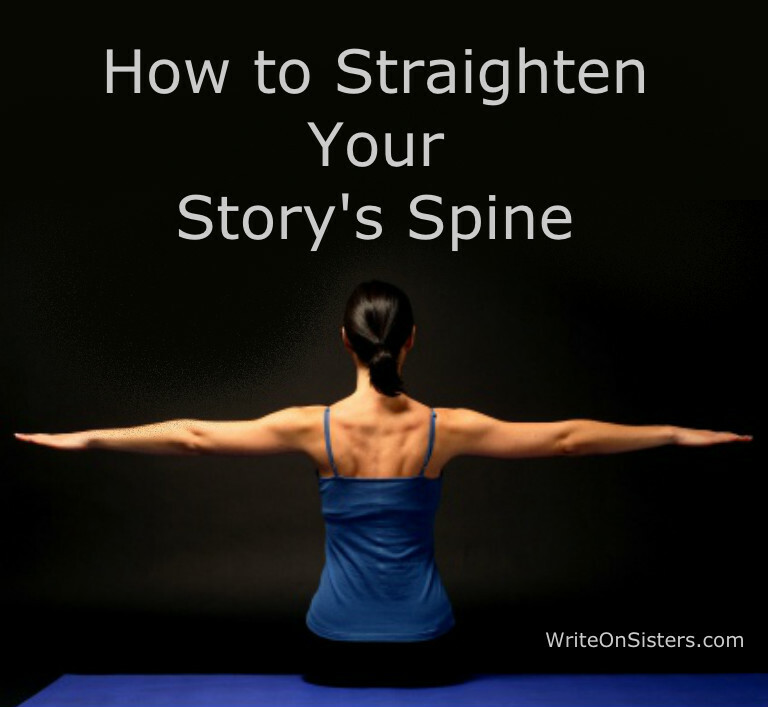 By doing something we screenwriters often call “tracking the story’s spine.” A story’s spine is the character arc woven into the plot; the two should always go together just like your vertebrae and your spinal cord. Tracking a story’s spine means making sure the protagonist’s transformation (arc) is addressed in EVERY SCENE of the journey (plot). Because after all, as I’ve said before (specifically in this post about character journeys), every story is about change. What’s the Big Story Question? Part 1: In order to have a character arc, the protagonist needs to change. They have to start out one way (flawed and not the best person they could be) and end up another (flaw overcome and better because of the journey – that is if the story follows a positive arc; negative arcs are the opposite). For example, in my WIP the heroine starts out doing bad things like using people to try to get ahead. By the end of the story she needs to change into someone who doesn’t do bad things to succeed. Part 2: Because of their character flaw, the protagonist will have an Inner Conflict. For a detailed explanation of what that is, read this post. In general, Inner Conflict is a desire for two things the hero wants (one of which is their outer Goal), but the catch is the hero can’t have both. So the whole story the protagonist must constantly choose between these two wants. Back to my WIP example, the heroine wants to be a better person (stop doing bad things like using people) but also wants a better life (her Goal is to escape the cycle of poverty by getting a college scholarship), yet she believes she needs to do bad things to achieve that. So yeah, she’s conflicted. Part 3: The Big Story Question is the will/won’t issue based on the Inner Conflict. Basically, in my story the question is: Will the heroine get a better life? The writer must make the protagonist face that question in every scene, and alternate between scenes that make us and the protagonist think they WILL succeed, followed by scenes that make us think they WON’T. And this question always pivots on the protagonist’s Inner Conflict. Not lining up the story’s spine is an easy blunder for writers to make, mainly because though we may KNOW the character’s arc, we don’t SHOW it in the plot. Note that I said “show” it, not “tell” it. You can’t solve this problem with internal monologue alone. The character transformation (arc) must manifest itself through actions (plot). #1 – Change. How does this scene influence your character’s arc? It can be a step forward or a step back, as long as something changes. #2 – Inner Conflict. Which “want” is your hero leaning towards in this scene? Make sure to alternate this from scene to scene. After all, a hero who favours one desire over the other isn’t very conflicted. #3 – Big Story Question. Does this scene ask the big, overall question? If not, your story has probably veered off course. Either cut the scene or revise it to make it relevant. You’re welcome and thanks for a great post. If you have multiple ongoing character arcs, I presume that you don’t need every single one in every single scene, but to what degree do you need your protagonist’s character arc per scene? Also, how does this relate to subplots? I imagine some scenes are going to be oriented more toward the subplot (and thus have an indirect relationship with the core plot). That’s a very good question! I totally wrote this post from a single protagonist point of view. However, if you have multiple plots with multiple characters, you don’t have to put every character’s arc in every scene. But at least one character per scene should have a change and inner conflict. As for subplots, well, they’re subplots and still connect to the main plot, which means that the Big Story Question should be present in these scenes as well, even if indirectly. One million 🙂 for my WIP. I really do love your posts but it seems I’m never in line with them. Like I’m doing something wrong here… I’d like to email you (either of you talented, lovely ladies) sometime. I would love to help you if I can. Send me your personal contact info with the form in the “Contact Us” tab and I’ll email you back. Excellent post, Heather. You’ve outlined a relatively easy strategy for evaluating our stories and coming to conclusions: works or doesn’t, that’s the question.